Hi guys, it’s me, that girl katie, Today would be my sister's 43rd Birthday! Although she isn't here to physically celebrate it, I knew I wanted to honor and celebrate her in a special way. For those who weren't able to attend her service, I produced the slideshow above that was presented as people entered the church. But I also wanted to love Stacy in the same way she loved me on my birthday this year. A month before Stacy died was my birthday and as she said it "Apparently, turning 40 is a big f-ing deal" Although, with all that went on I really didn't and haven't had time to think about this monumental birthday. All I really wanted for my birthday were cards and Stacy sent me a card that I will cherish for the rest of my life. In the card she wrote, 40 things she loved about me (Hello, tear jerker) So, I wanted to do the same for her. This past year has been anything but easy. A year where I flew back east 11 times in 12 months, stressed more than I ever knew was possible and cried most every day. But I am surviving because of the ultimate and priceless gift that Stacy gave me, realizing that HAPPINESS IS A CHOICE. I miss my sister HEAPS & HEAPS and think about her daily. Stacy and I had so many good times together and I am trying to focus on all the happy memories we shared over the last 40 years. Thank you so much for all your love, support and generosity. 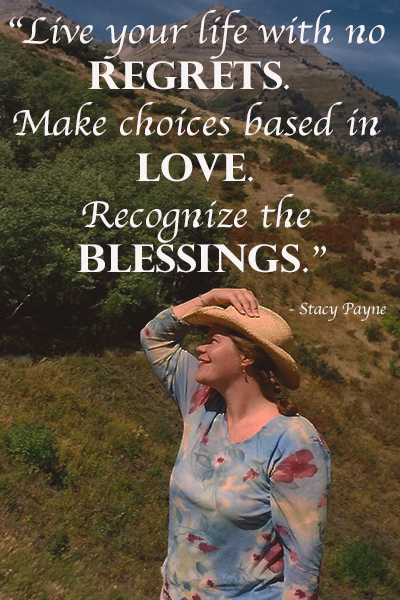 It truly makes choosing happiness that much easier and I believe that is what Stacy would want for everyone.